Have you ever wanted to change the path of several XREF’s at one time? Well you can. If you would like to find out how, please click here. 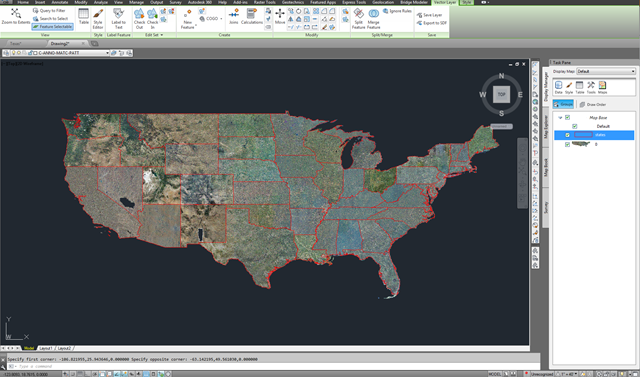 Upset not being able to plot GEOMAP Imagery in Map 3D, Civil 3D, or AIMS 2014? Here is an alternative using NAIP Imagery via WMS. Use Data Connect and add a WMS connection using the following URL. This will give you access to NAIP Imagery for the entire United States. The Imagery will resample as you zoom in. It will also re-project to match your current coordinate system. Highlight the link below and copy, then paste into the Server name or URL for the WMS connection. Recently I have come across several accounts that are having serious issues with getting a drawing or model file in the correct windows location. It is becoming a nightmare for those clients and their file management. The situation is this; clients are moving the files with Windows commands and tools, and NOT using the Vault file management tools. A few items to keep in mind when working with document management tools such as Vault. All files managed by or planned to be managed by Vault must NOT be manipulated by Windows commands. Opening a file from any folder and executing a “Save As” will NOT correctly manage the links to that file, Example: Opening an Assembly, A1 containing parts P1, P2,and P3, and running a Save As on A1, renaming it to A11 will NOT change the references to P1, P2 and P3. This simple operation can destroy the validity of the A1 and A11 Assemblies if the A11 assembly needs to reflect a different design iteration. If a user was to change P1, it will change in both Assemblies A1 and A11 thus the “Save As” does not differentiate either Assembly (A1 or A11), they are identical even though the A11 has been moved to a new folder. Instead using the Move files within the Vault client will correctly path the moved files to all others that they may have an effect on. In the example noted above in (2) moving the A1 assembly to a completely different folder will cause Vault to correct the links to parts P1,P2 and P3. Changing any Part. P1, P2 or P3 will then update Assembly A1. If a new complete design is needed to reflect a change that DOES NOT need to affect the assembly A1 and its part relationships, then the tool known as “COPY DESIGN” should be used. COPY DESIGN allows several things to happen, move to a different folder structure with in the vault, rename each and every effected file, heal all the relationships to the moved and renamed file and folder locations. I.E. A1 is moved to a new folder and renamed to A11, parts P1, P2 and P3 can be reused and still point to the A11 in the new folder location, or parts P1, P2 and P3 can be renamed so that they are unique to the A11 Assembly. Example P1 to P11 and P2 to P22 etc. This operation will again heal the links in each and every effected file as a result of using the “COPY DESIGN” tools. In short, with Inventor and the Vault Document system the only way to properly move, rename and copy designs is to use the tools within the vault client or the applications vault add-in tools. Hope this clears up any questions about file management using Vault and NOT windows tools and commands…. Annotation and dimensioning optimization Improved drawing splitting Fixed length Pipe graphics and BOM improvements PCF Export enhanced to support custom end types Numerous minor bug fixes Ortho BOM no longer counts components marked with Existing status Report Creator and Data Manager sort P&ID pipe sizes correctly We have also addressed minor bug fixes not related to isometrics.